Stefanie Almazan Delfini won the SGEB-Master-Award 2018 for an outstanding Master’s thesis for her investigation into the variation in stresses at the base of a rock column as ice melts from a joint on the back. Below is a quick overview of the study that will be presented at the EGU General Assembly in Vienna this year. Geometric parameters and minimum principal stress (+ve is tension) for time-dependant model. The emergence of alpine rock slope instabilities during periods of strong warming or abnormally high temperatures has been linked to the degradation of interstitial ice and permafrost through a number of mechanisms. Studies seeking a causative link typically suggest the instability results from an increase in driving stress due to the development of high joint water pressures, a loss of rock mass cohesion as interstitial ice melts from joints, or a combination of the two effects. Here, we investigate the potential for critical tensile stresses to form at the base of large (meter-scale) vertical rock columns in response to a combination of increased geometric freedom as ice melts out of a pre-existing fracture separating the column from the stable rock mass, and seismic excitation due to a) ambient seismic noise, or, b) a magnitude Mw 6 earthquake at a focal distance of 60 km. Using a 2D finite element model, we evaluate eigenfrequencies for a range of equivalent rock slope geometries with ice-backed column thicknesses ranging from 2 m to 7 m, heights ranging from 40 m to 11.5 m (respectively), and 100 different ice occupation configurations. The mass of the rock columns is constant in all computations, and we fix the input energy for time-dependant calculations in order to isolate the effect of our variations in model geometry. This assumes that the column is situated on a site in which the excitation frequency matches that which produces the largest deformation at the base of the column. 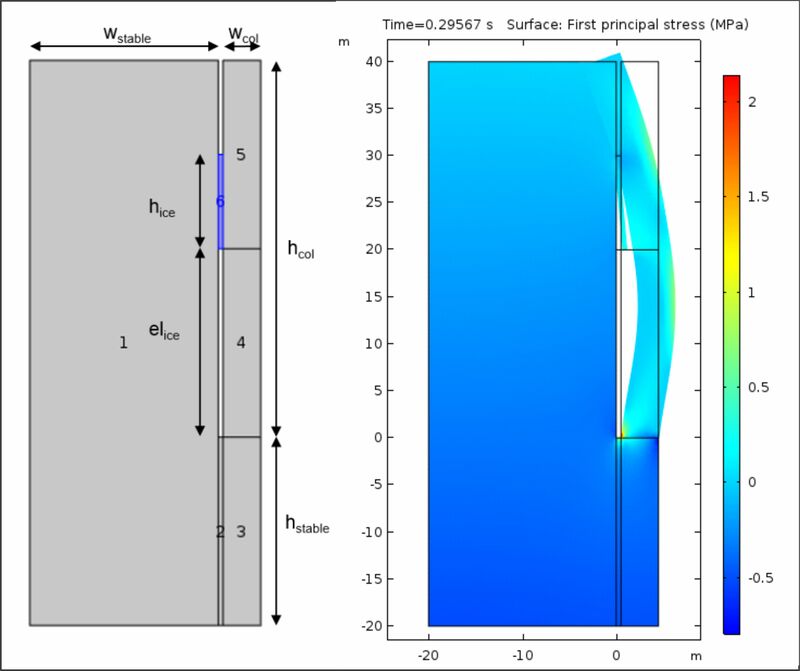 We then run two time dependent simulations (for excitation by ambient noise, or an earthquake) for each geometric configuration in order to assess the maximum tensile stress generated at the tip of the fracture separating the column from the stable rock slope. Figure 3.1 summarizes results from models for 20 m, 16 m, and 13 m high columns. These present a clear trend of increasing stress concentrations with decreasing ice volumes, as the column is allowed to sway more freely in response to both top-down, and bottom-up melting. Interestingly, stresses are slightly higher for the shorter, wider columns than the tall slim column with identical ice geometry. 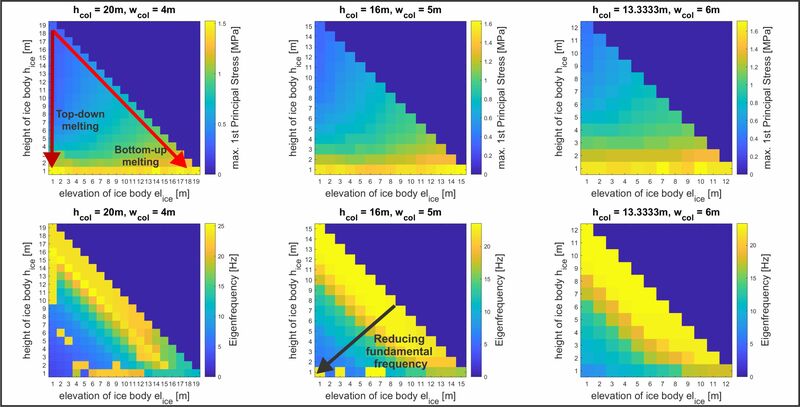 Figure 3.2 indicates that stresses tend to increase linearly for bottom-up melting (in which a 1 m high block of ice eventually fills the top of the bounding joint), and somewhat exponentially for top-down melting (in which ice becomes isolated near the bottom of the joint). The lower tiles of Figure 3.1 indicate eigenfrequencies decrease as the ice thins, and retreats downward from the opening of the joint. Figure 3.3 presents results for 40 m high, 2 m wide ice-backed (left), and ice-free (right) columns excited by equivalent earthquake energies. The maximum tensile stress generated behind the latter is 24 MPa, more than 10x that of ambient excitation and in excess of the tensile strength of most granites. When ice fills the rear crack, the peak tensile stress for both excitation conditions is just 0.4 MPa. We derive bulk material properties from a detailed study of a limestone column at the Les Arches site in France (see above). The unstable mass at this site is approximately 15 m high and 5 m wide. The figure below presents the Fourier spectra recorded by a seismometer located on the unstable block, as well as temperature and precipitation observations over a two-year period. During summer months the dominant frequency of the column is around 7 Hz, while the open joint on the site fills with snow and ice during winter, corresponding to an increase in the resonant frequency to approximately 20 Hz, matching our ice-free 16 m model (lower middle panel, in the six-part figure above). Our model results suggest that ambient vibration is unlikely to generate instantaneous damage in intact rock at the base of such columns, a pleasing result, as this would indicate similar features are extremely transient, and unlikely to be observed in the field. However, fatigue may play a role, and decreasing the volume or residence time of ice behind rock columns may reduce the lifetime of tall, thin columns composed of weak rock. This is likely to be particularly relevant in marginal permafrost regions in light of increasing global temperatures. Modeled tensile stresses induced by seismic loading are in the range of typical tensile strength estimates for strong rock, and although further work is required, our results suggest the simple increase in geometric freedom due to a reduction of ice in such rock slopes may lead to an increase in earthquake-triggered rock slope failures where supporting ice masses are not present. The Les Arches site is highlighted in the below film trailer about the in situ installations. Bottelin, P., C. Lévy, L. Baillet, D. Jongmans, and P. Guéguen. 2013. 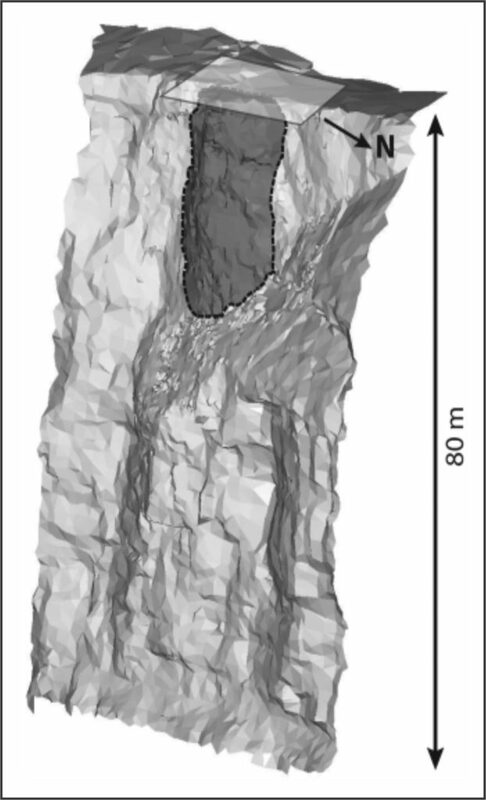 “Modal and Thermal Analysis of Les Arches Unstable Rock Column (Vercors Massif, French Alps).” Geophysical Journal International 194 (2): 849–58.